We’d love your help. Let us know what’s wrong with this preview of Bold by Peter H. Diamandis. 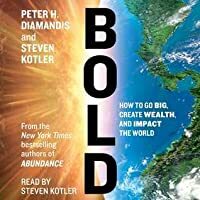 From the coauthors of the New York Times bestseller Abundance comes their much anticipated follow-up: Bold—a radical, how-to guide for using exponential technologies, moonshot thinking, and crowd-powered tools to create extraordinary wealth while also positively impacting the lives of billions. Bold unfolds in three parts. Part One focuses on the exponential technologies that are disrupting today’s Fortune 500 companies and enabling upstart entrepreneurs to go from "I’ve got an idea" to "I run a billion-dollar company" far faster than ever before. The authors provide exceptional insight into the power of 3D printing, artificial intelligence, robotics, networks and sensors, and synthetic biology. Part Two of the book focuses on the Psychology of Bold, drawing on insights from billionaire entrepreneurs Larry Page, Elon Musk, Richard Branson, and Jeff Bezos. In addition, Diamandis reveals his entrepreneurial secrets garnered from building fifteen companies, including such audacious ventures as Singularity University, XPRIZE, Planetary Resources, and Human Longevity, Inc. Finally, Bold closes with a look at the best practices that allow anyone to leverage today’s hyper-connected crowd like never before. Here, the authors teach how to design and use incentive competitions, launch million-dollar crowdfunding campaigns to tap into ten’s of billions of dollars of capital, and finally how to build communities—armies of exponentially enabled individuals willing and able to help today’s entrepreneurs make their boldest dreams come true. To ask other readers questions about Bold, please sign up. 1. If anything can go wrong, Fix It! !… to hell with Murphy! 2. When given a choice… take both!! 3. Multiple projects lead to multiple successes. 4. Start at the top, then work your way up. 5. Do it by the book… but be the author! 6. When forced to compromise, ask for more. 7. If you can’t win, change the rules. 8. If you can’t change the rules, then ignore them. 9. Perfection is not optional. 10. When faced without a challenge, make one. 11. “No” simply means begin again at one level higher. 12. Don’t walk when you can run. 13. When in doubt: THINK! 14. Patience is a virtue, but persistence to the point of success is a blessing. 15. The squeaky wheel gets replaced. 16. The faster you move, the slower time passes, the longer you live. 17. The best way to predict the future is to create it yourself! 18. The ratio of something to nothing is infinite. 19. You get what you incentivize. 20. If you think it is impossible, then it is… for you. 21. An expert is someone who can tell you exactly how it can’t be done. 22. The day before something is a breakthrough, it’s a crazy idea. 23. If it were easy it would have been done already. 24. Without a target you’ll miss it every time. 25. Fail early, fail often, fail forward! 26. If you can’t measure it, you can’t improve it. 27. The world’s most precious resource is the persistent and passionate human mind. 28. Bureaucracy is an obstacle to conquer with persistence, confidence and a bulldozer when necessary. Despite what it says in the title, this is not a "how to" book, it is an inspirational book. There are plenty of "case studies" to demonstrate that wealth can be created and you can have impact on those around you and, maybe even those you don't know. However, this is no more a road map than Columbus had when he departed on his trip to the Far East. I was a bit more disappointed with the chapter on building communities. There are plenty of lists but, as was said about many a river in Texas, it m Despite what it says in the title, this is not a "how to" book, it is an inspirational book. There are plenty of "case studies" to demonstrate that wealth can be created and you can have impact on those around you and, maybe even those you don't know. However, this is no more a road map than Columbus had when he departed on his trip to the Far East. I was a bit more disappointed with the chapter on building communities. There are plenty of lists but, as was said about many a river in Texas, it may be a mile wide but only a few inches deep. This book appeared on a couple of lists of best business books. 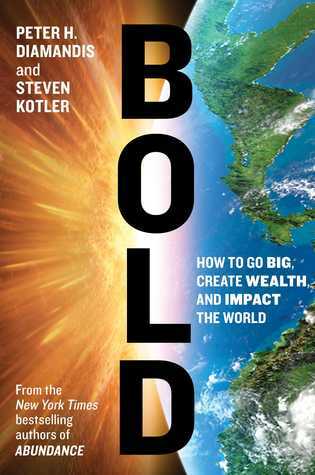 I should have been warned off by the hype of the title, "Bold--How To Go Big, Create Wealth, and Impact the World." Don't expect anything new here, it's recycled. If you haven't read anything about crowdsourcing, crowdfunding, building communities, etc. and want to catch up, maybe. But you can get up to speed on these concepts with Wikipedia in less time without the breathless delivery. Fantastic book which sparked tons of ideas for me. Should be required reading for all entrepreneurs or indeed anyone interested in where the world is heading in the next 10-20 years. Just wow! 1) There is so much change happening in this world at an exponential rate. It amazes me how much technology is impacting us and will continue to do so. Consider that, twenty years ago, the idea that a computer algorithm could help companies with funny names (Uber, Airbnb, Quirky) dematerialize twentieth-century businesses would have seemed delusional. Fifteen years ago, if you wanted access to a supercomputer, you still had to buy one (not rent one by the minute on the cloud). Ten years ago, genetic engineering was big government, and big business and 3-D printing meant expensive plastic prototypes. Seven years ago, the only robot most entrepreneurs had access to was a Roomba, and AI meant a talking ATM machine, not a freeway-driving autonomous car. Two years ago, the idea of living past a hundred was a crazy idea. You get the picture. 2) The Six D’s of Exponentials. I have developed a framework called the Six Ds of Exponentials. These Six Ds are a chain reaction of technological progression, a road map of rapid development that always leads to enormous upheaval and opportunity. Digitalisation. This idea starts with the fact that culture makes progress cumulative. Innovation occurs as humans share and exchange ideas. I build on your idea; you build on mine. Deception. What follows digitalisation is deception, a period during which exponential growth goes mostly unnoticed. This happens because the doubling of small numbers often produces results so minuscule they are often mistaken for the plodder’s progress of linear growth. Disruption. In simple terms, a disruptive technology is any innovation that creates a new market and disrupts an existing one. Demonetisation. This means the removal of money from the equation. Dematerialisation. While demonetisation describes the vanishing of the money once paid for goods and services, dematerialisation is about the vanishing of the goods and services themselves. Democratisation is what happens when hard costs drop so low they becomes available and affordable to just about everyone. Climbing Mount Bold is not just technologically difficult, it’s also incredibly psychologically difficult. Every innovator interviewed for this book emphasized the importance of the mental game, arguing that without the right mindset, entrepreneurs have absolutely no chance of success. I couldn’t agree more. Attitude is the ball game. If you think you can or think you can’t—well, you’re right. 4) You have to get use to everyone thinking you and your ideas are crazy. As Burt Rutan, winner of the Ansari XPRIZE, once taught me: “The day before something is truly a breakthrough, it’s a crazy idea.” Trying out crazy ideas means bucking expert opinion and taking big risks. It means not being afraid to fail. Because you will fail. The road to bold is paved with failure, and this means having a strategy in place to handle risk and learn from mistakes is critical. 5) Flow is an incredible way to hack productivity. Flow is something that really interests me and I will definitely be checking it out more. 6) You’ve got to start somewhere. If you don’t have a following or a source of credibility, create one. So if you’re lacking a track record, make one. Start your bold project with a much smaller effort aimed at letting others see you pull it off. Start collecting mind hacks by examining your own life and seeing what strategies consistently worked along the way. Turn those strategies into your laws. Why is this so important? Because fear is hell on decision making. As threat levels begin to rise, the brain starts limiting our options. The fight-or-flight response is the extreme version of this story. When we are confronting mortal terror, our choices are literally limited to three: fight, flight, or freeze. But the same thing starts to happen with lesser fears. As Emory University neuroeconomist Gregory Berns wrote in an article for the New York Times: “Fear prompts retreat. It is the antipode of progress.” And that’s why it’s important to write down your own laws. You’re essentially creating an external hard drive for when your internal hard drive is guaranteed to crash. So what’s his secret? Musk has a few, but none are more important to him than passion and purpose. “I didn’t go into the rocket business, the car business, or the solar business thinking this is a great opportunity. I just thought, in order to make a difference, something needed to be done. I wanted to have an impact. I wanted to create something substantially better than what came before.” Musk, like every entrepreneur in this chapter, is driven by passion and purpose. Why? Passion and purpose scale—always have, always will. Every movement, every revolution, is proof of this fact. Plus, doing anything big and bold is difficult, and at two in the morning for the fifth night in a row, when you need to keep going, you’re only going to fuel yourself from deep within. You’re not going to push ahead when it’s someone else’s mission. It needs to be yours. 10) Incentive prizes are now easier to accomplish through the HeroX platform. Incentive prizes, when used correctly (the book sets out an impressive step by step how-to) can leverage money and knowledge. Here’s the most important point: Abundance is not a techno-utopian vision. Technology alone will not bring us this better world. It is up to you and me. To bring on this better world is going to require what could easily be the largest cooperative effort in history. In other words, there is a bold and bright future out there. But, as with everything else, what happens next is up to us. continue rereading fifty shades of grey. There's a ton of useful information about crowdsourcing and crowdfunding here, but the book is very focused on starting things and incentivizing people rather than the far more difficult and interesting slog of actually doing the work. For example, we're told we need more flow and get 17 flow triggers, but the authors don't tell us how they've re-arranged their lives to be in flow. Omissions like this make some of the concepts feel superficial. If you're interesting in crowdsourcing, crowdfundin There's a ton of useful information about crowdsourcing and crowdfunding here, but the book is very focused on starting things and incentivizing people rather than the far more difficult and interesting slog of actually doing the work. For example, we're told we need more flow and get 17 flow triggers, but the authors don't tell us how they've re-arranged their lives to be in flow. Omissions like this make some of the concepts feel superficial. If you're interesting in crowdsourcing, crowdfunding, or how to be Diamandis, it's well worth reading. But this is far more narrow than the promised "go big, create wealth, and impact the world". Cast by the wayside is the technician/operator advantage of being insanely good at a few things. (Diamandis's rules include "When given a choice... take both!" and "Multiple projects lead to multiple successes.") There isn't a whole lot of practical advice here on what you need to find business partners, operate a company, monopolize the market, etc. Bold is a great book and it talks about the new technological trends and also on the power of platforms based on the six Ds: Digitalization, Deception, Destruction, Demonetization, Dematerialization Democratization. It also talks a lot about moonshot thinking and crowdsourcing strategies. I gave 4 stars because I believe that the book "Exponential Organizations" by Salim Ismail of Singularity University is more practical and already have many of the ideas found on "Bold". If you are in need of some serious inspirational kick start to Fuel Your Drive to yourself a favor and read (or listen) to this book now! Inspiring and resourceful book. The previous book - Abundance - was more of an explanation of exponential technologies and frameworks for growth mindset. Bold is a practical guide that teaches you and shows you examples of how to tap into the huge potential of exponential technologies while providing case studies and best practices for tools and techniques such as crowdfunding, community building, prize incentives and other. But it also touches on mindset and flow states, as well as the importan Inspiring and resourceful book. The previous book - Abundance - was more of an explanation of exponential technologies and frameworks for growth mindset. Bold is a practical guide that teaches you and shows you examples of how to tap into the huge potential of exponential technologies while providing case studies and best practices for tools and techniques such as crowdfunding, community building, prize incentives and other. But it also touches on mindset and flow states, as well as the importance of 10x thinking., and also something called "supercredibility", which basically means that if you want to launch a project, make sure that the first reaction is "When is it gonna be on the market?" and not "That's not possible." in short it's a method developed by Lockheed's Skunk Works during the World War II - it consists of several conditions that should be met in order to grant a group the freedom to explore a topic and innovate undistracted from daily life and bureaucratic hinderance. Another great part of the book was a interview and analysis of mental frameworks and life attitude of four known innovators - Richard Branson, Elon Musk, Larry Page and Jeff Bezos. Overall lots of interesting points and views that make you think about your fundamental motivations and drivers. Must read for anyone deeply interested in technological disruption. What’s more, this isn’t the only issue with money as a motivator. Money, it now appears, is only an effective motivator until our basic biological needs are met, with a little left over for discretionary spending. This is why, in America, as the Nobel laureate Daniel Kahneman recently discovered, when you plot happiness and life satisfaction alongside income, they overlap until $70,000—i.e., the point at which money stops being a major issue—then wildly diverge.12 Once we pay people enough so that meeting basic needs is no longer a constant cause for concern, extrinsic rewards lose their effectiveness, while intrinsic rewards—meaning internal, emotional satisfactions—become far more critical. 1. Focus on the User. We’ll see this again in chapter 6, when Larry Page and Richard Branson speak about the importance of building customer-centric businesses. 2. Share Everything. In a hyperconnected world with massive amounts of cognitive surplus, it’s critical to be open, allow the crowd to help you innovate, and build on each other’s ideas. 3. Look for Ideas Everywhere. The entire third part of this book is dedicated to the principle that crowdsourcing can provide you with incredible ideas, insights, products, and services. 4. Think Big but Start Small. This is the basis for Singularity University’s 109 thinking. You can start a company on day one that affects a small group, but aim to positively impact a billion people within a decade. 5. Never Fail to Fail. The importance of rapid iteration: Fail frequently, fail fast, and fail forward. 6. Spark with Imagination, Fuel with Data. Agility—that is, nimbleness—is a key discriminator against the large and linear. And agility requires lots of access to new and often wild ideas and lots of good data to separate the worthwhile from the wooly. For certain, the most successful start-ups today are data driven. They measure everything and use machine learning and algorithms to help them analyze that data to make decisions. 7. Be a Platform. Look at the most successful companies getting billion-dollar valuations . . . AirBnb, Uber, Instagram . . . they are all platform plays. Is yours? 8. Have a Mission That Matters. Perhaps most important, is the company you’re starting built upon a massively transformative purpose? When the going gets hard, will you push on or give up? Passion is fundamental to forward progress. If creating more flow is the aim, then the emphasis falls on clear, not goals. Clarity gives us certainty. We know what to do and where to focus our attention while we are doing it. When goals are clear, metacognition is replaced by in-the-moment cognition, and the self stays out of the picture. Applying this idea in our daily life means breaking tasks into bite-size chunks and setting goals accordingly. A writer, for example, is better off trying to pen three great paragraphs at a time, rather than attempting one great chapter. Think challenging yet manageable—just enough stimulation to shortcut attention into the now, not enough stress to pull you back out again. The challenge/skills ratio, the last of our psychological flow triggers, is arguably the most important. The idea behind this trigger is that attention is most engaged (i.e., in the now) when there’s a very specific relationship between the difficulty of a task and our ability to perform that task. If the challenge is too great, fear swamps the system. If the challenge is too easy, we stop paying attention. Flow appears near the emotional midpoint between boredom and anxiety, in what scientists call the flow channel—the spot where the task is hard enough to make us stretch; not hard enough to make us snap. If you look under the hood of creativity, what you see is pattern recognition (the brain’s ability to link new ideas together) and risk taking (the courage to bring those new ideas into the world). Both of these experiences produce powerful neurochemical reactions and the brain rides these reactions deeper into flow. To pull off such a massive moonshot, we’re going to need help, a lot of help. And thus our first challenge—convincing anyone our dream was doable. This meant, for certain, we were going to have to give birth to this dream above the line of super-credibility. Let me explain: In each of our minds we have a line of credibility. When you first hear a new idea, you place it above or below this line. If you place it below, you dismiss it immediately, often as ridiculous. If you place it above, you’re willing to give it the benefit of the doubt, follow it over time, and continue to make serial judgments. But we also have a line of super-credibility. When a new idea is born above this line, you accept it immediately and say, “Wow, that’s fantastic! How can I get involved?” The idea is so convincing that your mind accepts it as fact and your focus shifts from probabilities to implications. 2. When given a choice—take both! 5. Do it by the book . . . but be the author! 10. When faced without a challenge—make one. 11. No simply means begin one level higher. 20. If you think it is impossible, then it is for you. 21. An expert is someone who can tell you exactly how something can’t be done. 23. If it was easy, it would have been done already. 28. Bureaucracy is an obstacle to be conquered with persistence, confidence, and a bulldozer when necessary. This book has certainly got its pre-publicity quotes in order. Someone no less than former U.S. President Bill Clinton declares it to be a “…visionary roadmap for people who believe they can change the world” and the head of Deloitte Consulting describes it as “… an essential navigation tool for any proactive CEO who wants to remain relevant.” The list goes on! Acting as a how-to guide for using exponential technologies, “moonshot thinking” and crowd-powered tools to create extraordinary wealth w This book has certainly got its pre-publicity quotes in order. Someone no less than former U.S. President Bill Clinton declares it to be a “…visionary roadmap for people who believe they can change the world” and the head of Deloitte Consulting describes it as “… an essential navigation tool for any proactive CEO who wants to remain relevant.” The list goes on! Acting as a how-to guide for using exponential technologies, “moonshot thinking” and crowd-powered tools to create extraordinary wealth while also positively impacting the lives of billions, this book promises a lot. The book certainly packs a punch although it is not necessarily as accessible as it could be. The publicity material describes the book as a manifesto and a manual, being today’s exponential entrepreneur’s go-to resource on the use of emerging technologies. It is certainly capable of changing or refining your way of thinking. A lot of this book’s charm is hidden behind its futuristic label and packaging. Yet for a general business operator (or wannabe) there is so much great general advice and information too. You don’t have to be considering sending ultra-high-tech technology to the moon or finding a cure for a modern illness. Of course current day business leaders and today’s exponential technologies are brought into focus, analysing how these technologies can be disruptive and market changing, whether they are 3D printing, AI, robotics or the ever-connected Internet. Do you reckon you can jump on-board and make your fortune with some futuristic thinking? The authors believe it is possible and give a whirlwind look at funding, community building, thought processes and much more besides. A lot is crammed into ten chapters. It is hoped that a book of this relative complexity has a mass of further reading notes and citations plus a detailed index as it might be essential (these were missing in this pre-release copy). To many, this is one of those books you cannot pick up and put down - you will need to sit and focus on, locked away from all distractions. Despite its great content, this reviewer found it hard to warm to – it could just be a matter of style or one of those strange individualistic things – but the quality of the writing and the subject matter cannot be denied. It will be worth its investment in time and effort. Sometimes you need a bit of a struggle to get to greatness. The first part covered the landscape of innovation and the future in a terrific way. The second part felt more like a standard management tome but that said..I still learned a few things and enjoyed it. Peter Diamandis is a fascinating individual and so is his book. The end section where he list tips and strategies on how to actually execute on your ideas was the more valuable to me. Bold is a book about how any ordinary person, with a shoestring budget, can create a thriving business. The book shows the perspective and advice from a handful of extremely successful entrepreneurs, including Larry Page, Elon Musk, Richard Branson and Jeff Bezos. The book carries a strong sense of empowerment, and inspiration, enough to make anyone want to make a difference in the world. The author also puts the reader into perspective, as there are multiple inputs towards the overall message. Bold is a book about how any ordinary person, with a shoestring budget, can create a thriving business. The book shows the perspective and advice from a handful of extremely successful entrepreneurs, including Larry Page, Elon Musk, Richard Branson and Jeff Bezos. The book carries a strong sense of empowerment, and inspiration, enough to make anyone want to make a difference in the world. The author also puts the reader into perspective, as there are multiple inputs towards the overall message. The writing is easy to understand, and teaches new vocabulary related to key ideas and points, accumulating information as you go along. And these are just a handful of examples to inspire the reader. Whilst the book is great, there is one thing that could be done to make it even better. Quite often in the book, some key ideas are repeated too much, especially crowdsourcing and crowd funding. I run a small startup, and read this book to understand what a framework for effective scaling would look like. I tend to devour startup books, and was pleasantly surprised to see that this covered very different material from what other startup books cover. The first two sections of Bold present a 10,000 feet view of business, and discuss directional trends and meta-principles instead of concrete tactical advice. The third and last section gives great tactical advise on crowdsourcing and incenti I run a small startup, and read this book to understand what a framework for effective scaling would look like. I tend to devour startup books, and was pleasantly surprised to see that this covered very different material from what other startup books cover. The first two sections of Bold present a 10,000 feet view of business, and discuss directional trends and meta-principles instead of concrete tactical advice. The third and last section gives great tactical advise on crowdsourcing and incentive prizes. First half ot the book is inspiring. The second part is literally a playbook on how to use tools to create a successful project. Worth reading it. I will say a rather good book with lots of practical advice on how to manage a community, how to run a crowdfunding campaign and much more. As Greek, I admire Peter Diamandis, he has done so much. In fact, the star fleet academy would be the successor of his university, I believe and hope. There was more hype to the book than actual content. The book started rather slow and I was almost about to put it down without finishing it but somehow I kept on reading it further. The book for me after the first half became a little interesting. The crowd sourcing and community driven entrepreneurship chapters were something that I enjoyed reading and they came with some valuable advice. The book other than that repeated the same mantra that we're already familiar with. Absolutely mind blowing book! And quite short at 200~ pages not including acknowledgements etc. Peter will amaze you with what a person can achieve in the 21st century with exponential technologies and crowd funding/sourcing. We truly live in a world of abundance. Took me ~2 weeks to finish this packed book, but oh boy, definitely 5 stars from me! - Stages in exponential technologies: digitization, deception, disruption, demonetization, dematerialization, and democratizatio Absolutely mind blowing book! And quite short at 200~ pages not including acknowledgements etc. Peter will amaze you with what a person can achieve in the 21st century with exponential technologies and crowd funding/sourcing. We truly live in a world of abundance. Took me ~2 weeks to finish this packed book, but oh boy, definitely 5 stars from me! -	Stages in exponential technologies: digitization, deception, disruption, demonetization, dematerialization, and democratization. -	Aim BIG. Every dreamer is crazy until his dream is true. -	Rapid iterations, fail and get feedback a lot! -	17 different keys to hitting flow state. -	Multiple projects lead to multiple successes. -	4. Start at the top, then work your way up. -	If you can’t win, change the rules. -	The day before something is a breakthrough, it’s a crazy idea. -	Around page 180 – how to build private community, great for android formula! Not as interesting as Abundance, definitely worth reading if you're planning on creating a start-up. Diamandis amd Kotler intended this as a follow-up to their 2012 book Abundance, this time with a focus on the exponential attitude for entrepreneurs, and just a very few specific online tools to help 10x moonshot business success. A few parts of the book were useful, including an introduction to heroX with a history of the xprizes. Unfortunately, far too much self promotion crowded out truly valuable tools and progress from other groups, and too much repetition prevent going into enough depth on a Diamandis amd Kotler intended this as a follow-up to their 2012 book Abundance, this time with a focus on the exponential attitude for entrepreneurs, and just a very few specific online tools to help 10x moonshot business success. Unfortunately, far too much self promotion crowded out truly valuable tools and progress from other groups, and too much repetition prevent going into enough depth on any case studies or actual technologies, which would have been valuable. In fact it's very frustrating because these two authors are technical enough to go deeper with only minimal research effort. BOLD. I think all of you out there have some sense of how to be a bold entrepreneur. Even if you don’t know how to be an entrepreneur, I know you have some sense on how to be bold. You’re most likely on this page now if you are an entrepreneur or want to be, but even if you aren’t, you’re still welcome to read on, since ‘BOLD’ is not just about entrepreneurs, but also about using technology, having the right mindset, and using crowdsourcing, crowdfunding and communities to change the world. FULL BOLD. I think all of you out there have some sense of how to be a bold entrepreneur. Even if you don’t know how to be an entrepreneur, I know you have some sense on how to be bold. You’re most likely on this page now if you are an entrepreneur or want to be, but even if you aren’t, you’re still welcome to read on, since ‘BOLD’ is not just about entrepreneurs, but also about using technology, having the right mindset, and using crowdsourcing, crowdfunding and communities to change the world. Just a short tid bit about how I came upon 'BOLD'. It was when I was back in the US visiting my hometown, Portland, Oregon, for my summer holiday away from my day job. I had already bought a few books at Powell's Bookstore along with two books from back home in Surabaya, Indonesia. I walked into a Dollar Tree for some cheap goodies to bring back home with me when I unexpectedly ran into the book section I never realized exsisted at Dollar Tree. ALL of the books were various fiction, action, and sci-fi books. Except for ONE business book. 'BOLD'. Of course I bought it. It's the Dollar Tree where everything is $1, even the books. Never before. Never before the information age were the world’s problems able to be solved in the extremely short amounts of time that we are able to accomplish today. All of these mind-bending feats have been done with the help of extraordinary technology, or as the book calls it, exponential technology. That’s what the first part of ‘Bold’ gets into. The authors developed ‘The Six Ds’ which they go into brief detail explaining each progressive step which are as follows: Digitalization, Deception, Disruption, Demonetization, Dematerialization, and Democratization. It sounds confusing and it was a little when I first got into reading it, but after a little bit of study into it it became more clear. You should be able to understand the concept of ‘The Six Ds’ a bit better with the help of this infographic provided by Singularity University. The authors then go on to give the readers five solid examples of technologies; networks and sensors, infinite computing, AI, robotics, and synthetic biology, that are somewhere in the disruptive stage of the ‘Six Ds’ and how these disruptive technologies will change our world in the very near future. Powerful Lesson #1: You must be aware of all the upcoming technologies, especially if you’re involved in business. Don’t just be aware of it, but use it to your advantage and if you can, and you have the resources, then you need to create your own exponential technology so that you can get ahead of the game and not be left behind. Part two of ‘BOLD’ is about shooting for the 10x rule and how to go about achieving your goal with the right mindset and atmosphere by experimenting continuously to bring you beyond success while using real-life examples from Google and Elon Musk just to name two. There are also several wonderful suggestions on how to put yourself in the right mindset, or what the authors call ‘flow’, to reach the 10x goal. The examples given from real life people that have already succeeded in their life are great specially from my Hero, Elon Musk. Although I already read Elon Musk‘s biography which is filled with everything you would ever want to know about Elon Musk’s life and business, it was still nice to see how he applies the 10X rule in his businesses and risks everything that he does knowing that the outcome can be amazing. Richard Branson on the other hand, takes a little different approach to reaching his 10x. He still risks almost everything but he has always had a plan B in case something goes wrong. Whichever route you take, the lessons about how these well known bold entrepreneurs use moonshot thinking are priceless. I recommend taking the time to read about these leaders in other books or online sources since the information in ‘BOLD’ barely touches on the lives of these world changing entrepreneurs. In case you don’t know much about how the 10x rule works, here’s a short video from Between The Lines explaining it. Powerful Lesson #2: When you’ve got an idea or goal you want to accomplish you must shoot for the highest possible result even if it is risky. Put your full mind into the task at hand. Failure is okay, in fact essential, but to give up is not. This last section is all about the crowd. We’ve got crowdsourcing, crowdfunding, communities and how to build them, and incentive competitions. Basically the book tells you what crowdsourcing is and how wonderful it is. Also how you can use it. Using an example such as how you can get your work done for half the cost and half the time it might normally take working directly face-to-face with someone. You could even be working with someone on the other side of the globe as if he/she were right next to you. I personally find crowdsourcing useful for people that are just beginning their entrepreneurial career especially if your network is not that big. You’ve got a whole workforce out there at the tip of your fingertips. All you’ve got to do is just find the right match and get started. Whole businesses are actually built on crowdsourcing. That’s how powerful it is. You can do everything from home, or in a coffee shop without having to go to the office every morning. With crowdsourcing, running your small business becomes much easier. Freelancer - Free for all, any type of job you can think of. Tongal - TV commercials at one one-hundredth the price. Fiverr - Anything to do with art or design. 99Designs - Same as Fiverr but more focused on business designs. Top Coder - Coder heaven hacking away at software and algorithm development. Kaggle - Same as Top Coder. UTest - It’s a community of professional testers who test everything from functionality to your code. Reverb Nation - The free way of sharing your music to test it before you spend money publishing. Powerful Lesson #3: You can get almost any job done at half the cost or less through crowdsourcing. If you don’t have that big of a network, crowdsourcing has the reach of hundreds of thousands of able people that can give you quality work. Money, money, money. Isn’t money something that causes us pleasure, but most of the time, stress? Most companies and individuals say that coming up with the money for a new project is one of the most difficult tasks we can take on. Money is one of the top reasons why people stop. With crowdfunding at hand, your goals to create the next world changing product or service is possible even if you personally don’t have the capital. There are four types of crowdfunding ‘BOLD’ discusses. Donation - This is just like the traditional donation except for online. Debt - This is where you ask a loan from the crowd and pay it back with interest. Equity - If you’ve got a company already you can use this style of funding by selling equity in your company for cash in exchange for stock in your company. Reward or Incentive - In exchange for sending money to the receiver, the funder receives a reward like a t-shirt, or a copy of the actual product or service they’re funding. The higher amount sent, the bigger the reward. The type of funding ‘BOLD’ focuses on fully is Reward or Incentive funding where the authors give you two successful case studies and one almost successful one to inspire you and show you that funding does really work. The first case study is about The Pebble Watch. Second, about Let’s Build a Goddamn Tesla Museum YOU NEED TO CHECK THAT LINK OUT! It’s hilarious! And case study three is about the author’s own crowdfunding venture called The ARKYD Space Telescope which unfortunately failed, but on the light side will still be launching 100 telescopes by 2019. The book goes on to discuss some useful tips on who should start a crowdfunding campaeign and how to run one. Mentioning things such as how long you should run your campaeign to what your target should be, all the way to building the right team to help you spread your meaningful story. Powerful Lesson #4: If you've got an idea or product that you feel passionate about and know that it will make a big difference in changing our world. You also know that other people will feel the same way about it as you do, but you don't have the funds to create it, then you have an option. Create a plan to promote your idea through crowdfunding. If your idea is inspiring enough, then you will be able to get it funded. 'People get involved in communities not because of the money or the sponsors or the fact that they can get jobs as a result. The get involved because it's social. We give our community a place to go to get together because they want to get together. That's why communities work.' This whole chapter is quite amazing giving tips and morals about why communities exsist and how great communities are created. Actual communities are able to develop an understanding together through deep engagement. Likes and re-Tweets on Facebook and Twitter are just for cosmetics. The true communication comes when a bridge is built between people around the world to come together and have a meaningful conversation with each other about a specific niched topic. 'BOLD' talks about communities as living entities coming together to create something that they truly have a passion for, working together, and sharing all their ideas into one pool. It's better to have 1 hour of 100 committed members of your community that to have 50,000 inactive users. 'BOLD' gives you several tips about how to build and manage a successful community which could potentially turn into a successful business. People are naturally competitive especially when you give them something that has a high empathetic conotation. The best incentive prizes are those that solve important puzzles for all of humanity. This chapter starts with the history of incentive competitions which dates back to 1714 when the British Parliament offered 20,000 pounds to the first person/team to accurately measure longitude at sea. Another example was in 1795 when Napleon offered 12,000-franc for the first person/team to create a method for preserving food to feed his far away army marching off to war in Russia. This method is still used in food preservatives today. 'BOLD' goes on to give a few more modern examples of incentive competitions such as the Wendy Schmidt Oil Cleanup XCHALLENGE which happened in 2010, the disaster (not the cleanup) is now a major motion picture called 'Deepwater Horizon'. In 2006, The Netflix Prize was yet another example of incentive competitions when Netflix offered $1 million for whoever could write an algorithm that improved their existing system by 10 percent. At the very end of this information packed book, it explains how you can go about creating your guidlines in making a successful competition so that your participants can fully understand what your goals are and what the outcome should be. Your participants will no doubt create outstandng results. Powerful Lesson #6: When creating an open competition with enticing incentives, you never know where your talent will come from. The results will most likely be far above your original expectations. A key lesson here is that you should never doubt that a small group of thoughtful, committed citizens can change the world. When you're looking for a needle in a haystack, incentive competitions help the needle come to you. 'BOLD' does have several powerful lessons, each section connecting loosely to the next. Although the 'Bold Technology', 'Bold Mindset', and 'The Bold Crowd' sections of the book bring up some essential important tools for entreprenuers in the information age, I feel like it only touches the tip of the iceberg on these topics. Maybe that is what the authors' goal was in the first place only to write an introduction to these topics, but it would have been much more efficient to write one whole book on each section or follow 'BOLD' up with a book for each topic. This book had its moments but overall there was too much filler/duplicate content. I didn't feel like I was getting an inside look into the mind of a successful innovator/entrepreneur, but rather a SparkNotes of the success of different companies/people. I found myself skim reading near the end of the book. The second half focuses a lot of crowd funding and crowdsourcing which didn't really interest me. Overall, I didn't really feel like I learned much about how to make an impact in the world alt This book had its moments but overall there was too much filler/duplicate content. I didn't feel like I was getting an inside look into the mind of a successful innovator/entrepreneur, but rather a SparkNotes of the success of different companies/people. Overall, I didn't really feel like I learned much about how to make an impact in the world although it was slightly motivational. If you enjoy reading company/entrepreneur case studies and want to learn about crowdfunding/crowdsourcing, you'll probably like this book. The topics in the book were interesting and seemed somewhat related, but I was having a hard time grasping how the ideas were going to be combined into a strategy someone could actually use. That is, until I got to the chapter where the authors advertise their new platform that does just that. Some of the book was interesting, but it seemed like it was written for the platform, rather than the platform being created from these bold ideas. Dr. Peter H. Diamandis is an international pioneer in the fields of innovation, incentive competitions and commercial space. In 2014 he was named one of "The World’s 50 Greatest Leaders" – by Fortune Magazine. In the field of Innovation, Diamandis is Founder and Executive Chairman of the XPRIZE Foundation, best known for its $10 million Ansari XPRIZE for private spaceflight. Diamandis is also the Co Dr. Peter H. Diamandis is an international pioneer in the fields of innovation, incentive competitions and commercial space. In 2014 he was named one of "The World’s 50 Greatest Leaders" – by Fortune Magazine. Diamandis is also the Co-Founder and Vice-Chairman of Human Longevity Inc. (HLI), a genomics and cell therapy-based diagnostic and therapeutic company focused on extending the healthy human lifespan. He is also the Executive Founder of Singularity University, a graduate-level Silicon Valley institution that studies exponentially growing technologies, their ability to transform industries and solve humanity’s grand challenges. In the field of commercial space, Diamandis is Co-Founder/Co-Chairman of Planetary Resources, a company designing spacecraft to enable the detection and prospecting of asteroid for precious materials. He is also the Co-Founder of Space Adventures and Zero-Gravity Corporation. Diamandis is the New York Times Bestselling author of Abundance – The Future Is Better Than You Think and BOLD – How to go Big, Create Wealth & Impact the World. He earned an undergraduate degree in Molecular Genetics and a graduate degree in Aerospace Engineering from MIT, and received his M.D. from Harvard Medical School. Diamandis’ mission is to open the space frontier for humanity. His personal motto is: "The best way to predict the future is to create it yourself."